When charmed by the spell of Las Catalinas, Guanacaste, few places allow you to open your arms, breathe, and embrace the many lovely views in front of you as does this elegant beach apartment’s classic wrapping balcony. Its ample corridor is perfect to bask in the scent of your morning coffee or enjoy an aperitif at dusk, as you overlook the beautiful village below you and glimpse at the sea beyond. Just a 2-minute walk from the beach, the open space floor plan of this Costa Rican beach flat makes it particularly suited for families or groups of friends, with a spacious kitchen with dark, wooden furnishing and finishes, an elegant dining space with a bold round table that can sit six guests, large windows and doors, and a second terrace ideal for social gatherings. 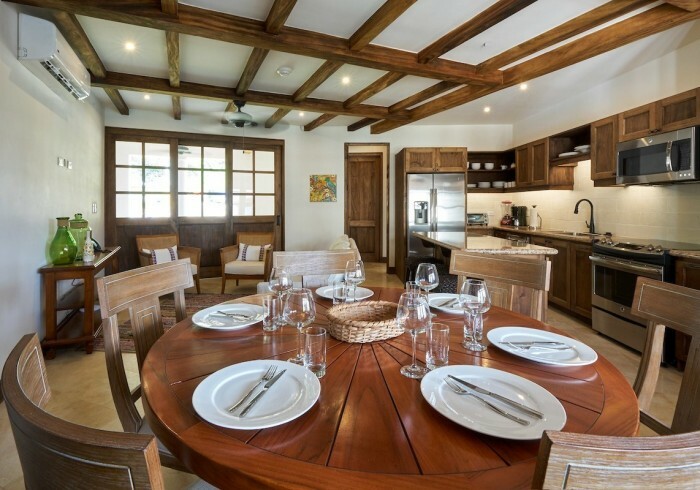 The fine wood is a leitmotiv of this vacation home in Guanacaste, recalling the tropical dry-forest nearby. Abundant in its two suites, both with king beds and an en-suite bathroom - the master suite with a spa-style bath -, it gives the entire apartment an air of old-fashioned sophistication with a rich, rustic feel. Refined, airy, and imbued with a classic charm, this beach apartment at the heart of Las Catalinas, Guanacaste lets you breathe in the beauty of the place like few others. Up to six guests can be accommodated in this Carlota apartment, where children are welcome.